140 Truck operating at the scene of a commercial structure fire in Versailles Volunteer Fire Company district. 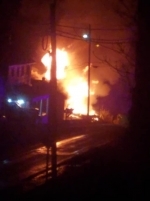 This morning we sent an Engine Crew to Rostraver Township for stand-by while they worked a Structure Fire. Welcome to our Official Website! The Elizabeth Township Fire Department is made up of two fire stations, in a collaborative effort, responsible for providing fire and rescue services to the Township of Elizabeth. 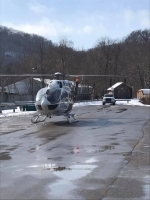 We are located in Allegheny County, Pennsylvania, 25 miles southeast of Downtown Pittsburgh with a current population of over 13,000 residents. Our Township is made up of approximately 22 square miles of commercial, residential, and rural areas. Our Company consists of over 100 trained, dedicated, and hardworking individuals answering approximately 400 calls for help annually. Our department provides first due coverage to the Greenock, Blythedale, Boston, Industry, Smithdale, and Victory areas as well as automatic aid to our 3 sister stations: Blaine Hill VFC, Central VFC, and Buena Vista VFC; mutual aid to the neighboring Boroughs of Elizabeth, Lincoln, Jefferson, Sutersville, Versailles, and Liberty, and The Townships of Forward, Sewickley, and Rostraver. We currently operate out of 2 stations consisting of 1 engine, 1 rescue-engine, 1 109' aerial ladder,1 mini pumper,, and 2 squads. We are 100% volunteer and are always looking for new members. We would like to thank our members for all of their hard work, the Township of Elizabeth for their continued support, and the residents for their generous donations. Please stop back soon and stay safe! 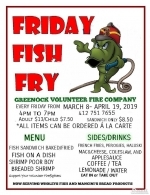 At the Greenock Station, we're having our annual Friday Fish Fry!!! Doors open 4pm to 7pm. Every Friday during Lent, March 8, 2019 to April 19, 2019. Call 412-751-7655 for Take Out orders. Annual Sunday Breakfast Beginning Sunday January 13, 2019 and running every Sunday until Palm Sunday April 14, 2019. Breakfast will be from 8:00am to 12:00 noon at the Blythedale Station. Eat In or Take Out Available. 1799 Blythedale Rd. Dancing Queen February 16, 2019 at Boston Spectrum 6pm. Call 412-751-7655 for tickets! Tonight your Volunteers practiced using our “Jaws of Life” tools. The ETFD carries both hydraulic and battery operated tools. 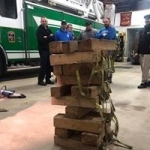 The firemen got to play a “game” of Jenga with the tools giving them practice handling the tools and getting used to their pros and cons. 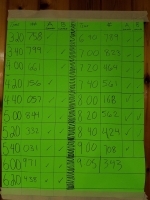 This site has been viewed 45,383 times.